I scream, you scream, we all scream for ice cream! There’s no denying at the height of summer, nothing pleases the eyes more than the sight of an ice cream van. Our family love ice cream and have a family joke about how we’d love to travel Australia in an ice cream van, complete with Mr Whippy tune… but in reality, this is as close as it could get – an OTO Ice Cream Truck! 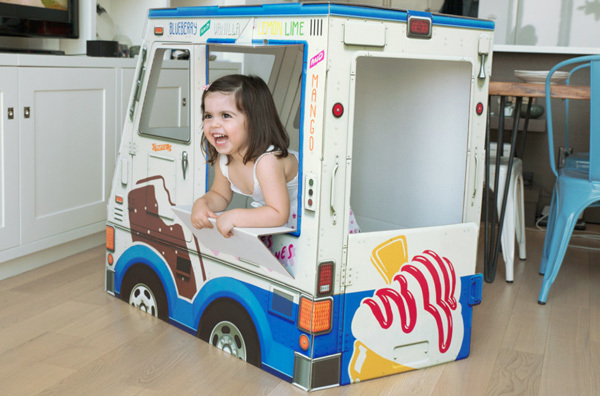 An all recyclable, all non-toxic, all awesome cardboard food truck for kids, designed to ignite imaginative play that we are sure, will last hour after hour, day after day, for as long as there are customers wanting imaginary ice cream (much kinder to the body than the real deal). The truck itself is beautifully detailed in vivid colour and you can make your own custom plates to fit for a personalised touch. 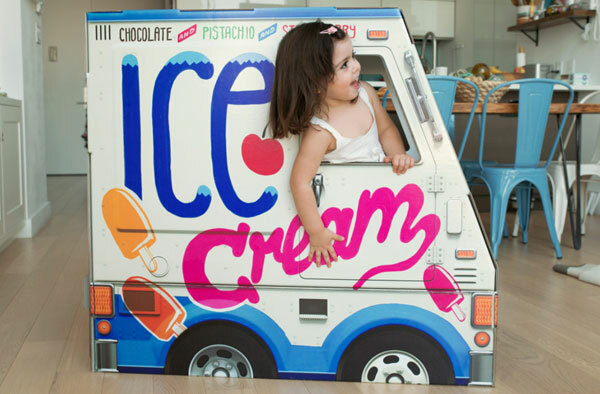 Standing at a metre tall and a metre long, we’re not surprised that this package of ice creamery goodness isn’t delivered to Australia, but for our readers residing in the United States, you’re in luck, you can purchase your very own truck for US$60 at Famous OTO.